We are currently working towards our 6th Green Flag : Global Citizenship and Recycling. Our Green Schools Committee have been working hard over the past 18 months on projects such as Christmas Shoe Boxes , Teddy Bears for Syria and Friends of Syria. We recently achieved our Fair Trade Stamp having raised an awareness of the importance of Fair Trade and buying Fair Trade goods. We are working towards better recycling and the Committee frequently check that our rubbish is sorted correctly and that any plastic is carefully washed. 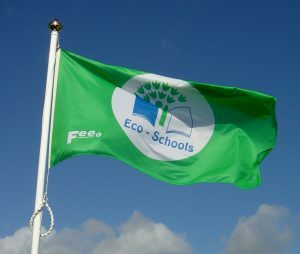 We look forward to raising our 6th Green Flag in the summer term.